Life is short, Existence is not. Nasr Saad is a man who asks weighty questions: How was the universe created? Is there life after death? Most importantly, he asks, Why have the disciplines devoted to such issues—religion, philosophy, and science—failed to provide adequate answers? Saad believes that a new paradigm is needed, and he offers one in The Fourth Dimension of Existence. Saad is no New Age free thinker, but an accomplished scholar with degrees in philosophy, theology, and atomic physics. He writes that a three-dimensional point of view can be used to detect and measure all manner of matter, but it is necessarily limited when considering nonmaterial phenomena, which he calls spirit. Spirit is often considered the territory of religious and philosophical thinkers, not scientists. 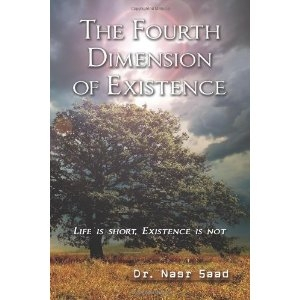 To understand spirit, Saad suggests the need to scientifically recognize and understand a fourth dimension. Some readers may cheer Saad on for breaking the mold with his bold concept, but others may doubt him for his lack of a fully developed model of the fourth dimension he proposes. Strongest when explaining scientific developments, Saad writes clearly about several complex topics, from the behavior of elementary particles to the elliptical orbits of planets. His arguments in the fields of religion and philosophy are esoteric as he ponders such puzzles as the difference between the “formation” of the universe and the “creation” of the universe. Saad repeatedly returns to his proposition that there must be another fundamental aspect of existence that is not yet understood. The circular discussion can get a little dizzying, but Saad provides examples of previous paradigm shifts to bolster his position that humans can learn to see things in a new way. Examples from the work of groundbreaking scientists demonstrate how science in particular is amenable to revision. He cites Albert Einstein’s theory of relativity, for instance, which challenged and overturned the scientific community’s understanding of time as a constant measurement. Saad savors the many questions implied by his theory, and in the final chapters he puts forth more specific evidence to prove the existence of a fourth dimension. Here, science and mathematics take center stage, and readers who may have drifted away in all the talk of spirit will find themselves anchored in calculations and empirical evidence. For instance, Saad offers calculations that show how a person traveling near the speed of light could experience only one year of life while ten years passed on Earth. Saad’s argument may or may not convince readers that the discovery of a fourth dimension is inevitable, but it will certainly get them thinking, which is the first step toward the paradigm shift he seeks.